On this day in history, 1991, one of the series of killing sprees that would help inspire the phrase “going postal” occurred. A former postal worker, Joseph Harris, who was angry that he had been fired eighteen months previously in April of 1990, murdered his ex-supervisor Carol Ott and her boyfriend in the home they shared. 30-year old Ott was killed with a samurai sword, while her boyfriend Cornelius Kasten Jr. was shot in the head. Harris had left a note in his apartment complaining about the authorities at the post office and promising to exact his revenge on those who he had perceived to have wronged him. His beef over his firing stemmed from the fact that despite 12 years of working for the Postal Service with an apparently clean record, his supervisor ordered him to take a “fitness for duty” psychological exam, with a doctor paid for and chosen by the Postal Service. He viewed this as them just trying to get rid of him, though of course in light of later events, perhaps his supervisor had good reason for ordering the exam. In any event, he refused, at which point he was fired. The American Postal Workers Union apparently did little to help him out in the situation, which further upset him. He handcuffed the Edwards family and shot Roy Edwards to death after assaulting his wife and two daughters (9 and 7). After killing Edwards, the mysterious ninja disappeared. Police never considered Harris a suspect in the Edwards slayings because hundreds of investors had recently been burned by Edwards. Of course, after his postal killing spree, they started looking at him in a different light and made the connection. Given that Harris, not surprisingly, had suffered from various psychiatric disorders his entire life, when his trial began, his lawyers contended their client was insane, and had told psychiatrists that he had been compelled by “the ninja spirit” to commit the murders. Nevertheless, Harris was convicted of both the Montvale and the Ridgewood murders in 1992 and was sentenced to death. Two days before a New Jersey Supreme Court fight in September 1996 to overturn the death penalty was about to begin, Joseph Harris died in prison apparently of natural causes. 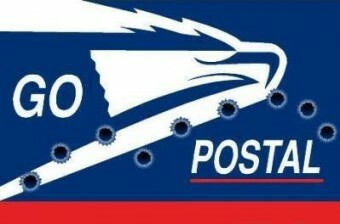 In the decade between 1983 and 1993, 11 mass murders occurred in U.S. post offices. Because of these attacks perpetrated by postal workers in the workplace, “going postal,” even all these years later, is still understood by young and old to mean having a violent, potentially murderous outburst, not unlike “run amok” originally meant, though now has a somewhat more toned down common usage.